In February 1992 the former secretary of the Cambridge United Supporters' Club committee and of the Cambridge & District Sportsmen's Guild committed to paper these memories of the years between 1947 and 1961. In a United programme of February 1992, the manager John Beck enquired if any of the older supporters knew the history of the Habbin Stand. I visited Andrew Pincher, the programme manager, and explained to him of my involvement with the club from 1947 to 1961. He asked me if I would write an article for the programme or portray a story of the main events as they took place during my years of office. I’ve been pondering since where to start on events that happened four and a half decades ago – so I’ve decided to start at the beginning. I’m Percy Neal. I served in the Royal Air Force for six and half years during World War II, including four years in India, Assam and Burma. I returned to Cambridge, my hometown, in late 1945 to await demobilisation. My social highlight of the week was a dance held at Fen Ditton village hall, where I met and fell in love with – and later married – Edna Crane. She was a sister of Russell Crane, who was then one of our star players at Abbey United. He was often described in the Cambridge News as the Human Dynamo. Percy Neal is pictured, fifth from the left, at a Supporters' Club committee meeting. Also in the picture: Paddy Harris, Bill Harrison, Geoff Proctor, Harry Habbin, RJ Wadsworth, Richard Duce, Stan Starr, Cyril Swainland, Ron Thulbourn and Jack Woolley. Herbert Crane, Russell’s father, served on the committee of a social club in Fen Ditton, which functioned in the Old School Rooms, a wartime club run by volunteers of the local Civil Defence and Home Guard. I agreed to become secretary. With the war now in the past, membership dwindled and within a year the committee decided the club should be wound up. It voted that the furniture, fittings and funds (approximately £200) should be handed over to Abbey United FC. The handover was duly performed and through this I first met Geoff Proctor, a future chairman of the directors of the Abbey. He was delighted to receive the windfall. A few days later, Geoff invited me to meet him and his colleagues at the Supporters’ Club. There was a large gathering but within a few minutes Geoff spotted me, led me to a quieter place and over a drink explained his motive in inviting me into the club. It was the Supporters’ Club annual general meeting, and I had been proposed and seconded for the post of club secretary. By nine o’clock a somewhat bewildered Percy had started a 13-year stint at the Supporters’ Club and I was welcomed warmly by the chairman, Harry Habbin. The week following the agm, we had our first committee meeting in my role as secretary, with Harry in the chair. I met many supporters who had been involved before my time, and the team of lady supporters led by Lil Harrison. I soon learned the objectives of the Supporters’ Club, that Harry was a pioneer of the club and that its formation had been at the Corner House pub, Newmarket Road, where Harry and his wife were landlord and landlady. Providing central heating and having the bar refurbished were the two main objectives at that time. Central heating was eventually installed after a big fundraising drive, extending to whist drives, Saturday night dances and various social events. It was amazing how many tradesmen, members of the club, were willing to offer their services voluntarily and in a few months the club had replaced a large cast iron stove with a long chimney to the ceiling, with many chairs placed in a circle around it to allow supporters to benefit from the warmth. Refurbishing the bar was the next task. After several discussions at committee, we invited the representative of Green’s Brewery, Luton, where the club purchased its beers, wines and spirits. We outlined our proposals and the representative reported back to his directors. We then received an invitation for a small deputation to visit the brewery to discuss the idea at director level. We were well entertained and visited Luton Town Supporters’ Club, where the brewery had recently installed a new bar. Within a few months, a similar bar was installed in our club at the brewery’s expense. Above, Percy Neal's sketch of United's Newmarket Road ground in the 1940s. 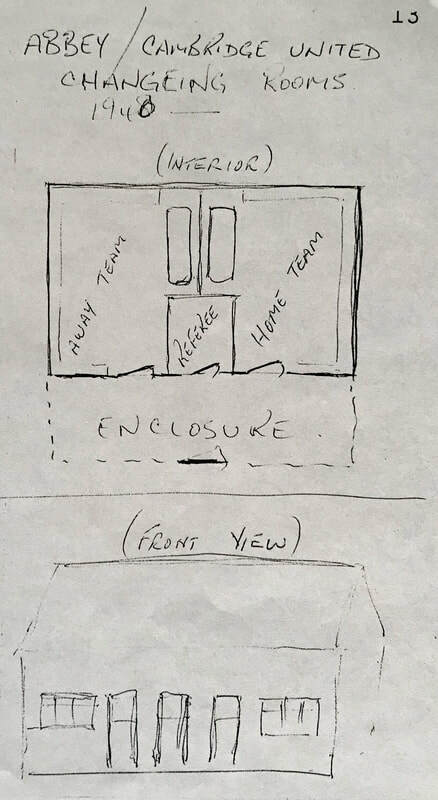 Below, Russell Crane's sketch of the old changing rooms situated on the Coldhams Brook side of the ground. At this stage I will endeavour to outline the layout of the football pitch and the outbuildings. At the Allotments End was a small step-up terrace constructed mainly of railway sleepers. Where the main stand and dressing rooms are now was a small, wooden covered stand with seated accommodation – wooden forms stretching from one end to the other, seating about 300 people. On the Brook-side (where the Habbin Stand was constructed in later years) was step-up terracing, again built with railway sleepers. Along the same side were the players’ primitive dressing rooms. At the Newmarket Road end were the Supporters’ Club and refreshments bar, which provided teas to both the football areas and those in the Supporters’ Club. Where the car park and administration offices are now was a Corona mineral water factory and near this was a large, rambling Victorian house and gardens. The football club, in their better-off days, were able to purchase this property and gained planning permission to demolish and develop a car park. Corona eventually moved to better premises and the old factory was dismantled. The entrance to the ground before this all happened was a narrow passage along the boundary fence of the Corona Works. Turnstiles were unheard of in the old days – we had a wooden hut with three pigeonholes. Another entrance was a further 50 or 60 yards along Newmarket Road, on an unadopted gravel lane known as Cut Throat Lane. While I was compiling these notes, my brother-in-law Russell Crane kindly sketched the exterior and interior of the primitive dressing rooms. I understand these were built about 1940, or earlier; Russell’s sketch is shown on this page. 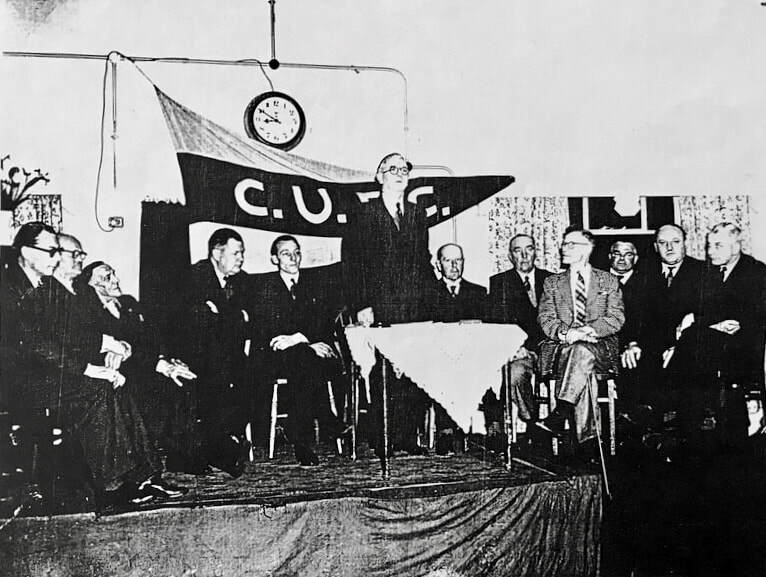 In the early 1950s a joint meeting was held between the football club directors and Supporters’ Club committee, the subject of which was ground improvements. 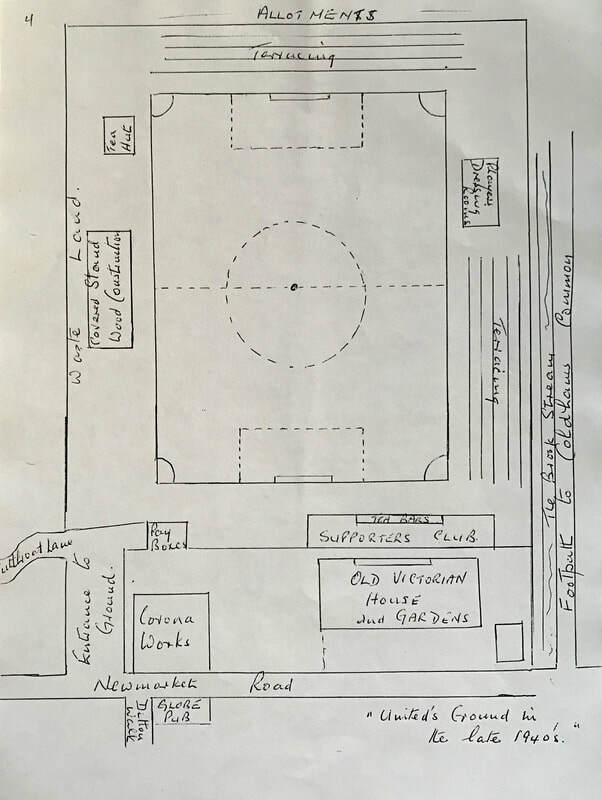 Geoff Proctor outlined the directors’ aims, such as a covered stand at the Newmarket Road end, replacement of the primitive dressing rooms, enlargement of the small wooden stand and improvements to the terracing – quite a tall order with the stretched resources available. The Supporters’ Club committee, under the continuous inspiration of Harry Habbin, decided to tackle the task of a covered stand at the Newmarket Road end. An approach was made to Jewson of Norwich, which was very experienced in covered accommodation structures. The Jewson’s representative visited the ground to assess our needs and the company’s drawing office submitted plans for a suitable stand for our approval. Jewson’s agreed that the footings, brickwork and terracing could be carried out by the supporters under their guidance, in order to reduce costs. Their quotation to supply and erect the steel stanchions, roof supports and roof covering amounted to £1,250 – far in excess of our resources. Jewson’s was kind to us and agreed to carry out the work on payment of £250, with the balance being paid off at the rate of £50 a month. The work commenced and after just 18 months of sweat, toil and much fundraising, the first of the club’s dreams had materialised. Way back in the 1950s, the Cambridge Evening News gave good coverage to all sporting events in the county – Peter Fearn was a sports reporter at that time. The News offices and printing presses were in St Andrews Street, on a site now occupied by the modern AA offices. The company I worked for had offices in Regent Street. By habit, I have a coffee break at the SNAX coffee bar in Regent Street, where I first met Peter Fearn. This developed into a daily event and he always greeted me with ‘What’s new, Percy?’ And titbits of events taking place at the Supporters’ Club were often highlighted in the sports column the same evening. The News eventually produced a Saturday night sports edition called the Light Blue, nicknamed the Green-un. The colour of the paper was pale blue, and it was compiled and printed on Saturday afternoon and on sale by 6pm. At this time a large queue formed outside the Globe public house opposite the football ground, often stretching into Ditton Walk and often before the print was dry. I have several old editions of the Cambridge News. The prices in the old days (in old pence): 1950 – 1.5d, 1955 – 2d, 1958 – 2.5d. Inflation kept fairly static in those days. In the early 1950s the football team were semi-professionals who played in the United Counties League. They were doing quite well and prospects for promotion to the Eastern Counties League was on the horizon. The football club therefore engaged the services of a player-manager: Bill Whittaker. Bill achieved a marked impact on the style of play and under his guidance the team caught the public eye in notable FA Cup runs. The club gained promotion to the Eastern Counties League. Bill eventually left the club in March 1955. At some stage in 1954 a deputation of the club’s directors and the Supporters’ Club committee, with Harry Habbin still in control, met to discuss the future of the football club’s endeavours. Geoff Proctor illustrated the club's success in the Eastern Counties League, with entry to the Southern League envisaged in the not too distant future – the next step towards Fourth Division football. Further ground developments were necessary, and in order to function in these higher leagues, the club would require at least £1,000 a month income from the Supporters’ Club – a vast task that appeared impossible. The Supporters’ Club purchased from a disused army base in Quy a wooden hut measuring 40 feet in length and 18 feet in width. The Army authorities wanted £40 for the hut, providing we dismantled and transported it. This was done in record time by gangs of supporters. Foundations were laid and the hut was reassembled at the ground. 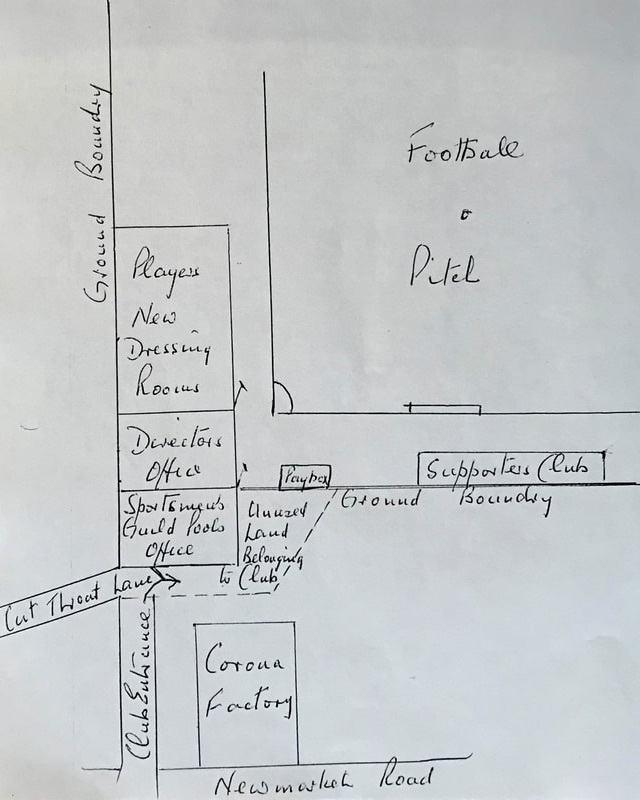 The illustration shows how this was done; by building the pools office outside the club’s boundary we satisfied the various authorities and additionally provided a directors’ office and modern dressing rooms for the players. While this hut was being erected, a committee was formed, independent of the Supporters’ Club, consisting of myself (secretary), Jack Rayner, Herbert Crane, Len Selmes, Ernie Ward and Ron Clifford, to operate the football pool; this formed the bulk of the Cambridge & District Sportsmen’s Guild. Jack Rayner, who was in the printing business, soon had available 10,000 membership cards, which had to be stamped twice (members’ and office portions) with a combination of three numbers. Again, we hit a snag: the suppliers of the stamp printing machine required around 12 weeks before they could be delivered. We approached the Great Yarmouth club and asked to borrow their machine. They agreed, but only if we used it on their premises. Our committee travelled to Yarmouth on two consecutive Sundays and stamped enough cards to get the pool launched. Percy Neal's sketch of the new pools office, directors' office and changing rooms. On Friday evenings the committee unpacked the agents’ postal returns, Friday pm being the deadline, checked their books and stake returns and completed a ledger for an audit check, filing membership costs in sequence and sorting the cash received, which was packed into night safe bags for deposit in the night safe at our bank – National Westminster in Trinity Street – the same night. On Saturday mornings committee members took it in turns to convey in a suitcase the agents books’, ledger and agents’ returns to our accountants, J Chater & Sons, where an audit was carried out. The value of dividends to be paid and the amount of pools duty to be paid to the Inland Revenue was calculated. The books were collected from the accountant at midday; another member of the committee visited the bank to retrieve the night safe pouches and credit the cash to the Guild’s account. This running about, in all weather, was done on bicycle – the family car was not known to us then. On Saturday afternoons we awaited the football results, compiled the list of winners and prepared their cheques for posting to the agents on Monday. This routine went on for two seasons and resulted in a successful growth in the pool. Any members of the public could participate in the pool providing they dealt through our agents. The stake money was one shilling a week for each member. In October 1957, at the Guild’s third agm, we were proud to report a membership of 21,000 and a network of 120 agents, in towns and villages reaching out to Horseheath, Saffron Walden and Bishop's Stortford. The directors were delighted with this regular weekly income from the Guild, which was boosted from time to time by donations from the Supporters’ Club. We eventually extended the pool to operate in the summer months by using Australian football results, thus improving the income. As time passed and football pools were developed by clubs up and down the country, government legislation was introduced that increased the amount of pools duty to be paid for the past and in the future. It developed into a legal jungle. We, as a committee, had our plate full running our pool, so our solicitors (Wild & Hewitson) and accountants (J Chater & Son) dealt with the legal problems that arose. Mr Hewitson eventually advised us that the Sportsmen’s Guild might be entitled to a rebate from the Inland Revenue on pools duty paid in the past. The outcome was pleasing – a cheque from the Inland Revenue containing a refund of over £9,000 dropped through our letterbox. How should we spend this windfall? A joint meeting of the club’s directors, Supporters’ Club committee and Sportsman’s Guild decided its fate. It was agreed that the cash should be spent on installing the floodlights as you see them today. This indeed was a great asset to the club. In 1956, Russell Crane decided to hang up his boots, having played football since the age of 15, mostly at Abbey United. While serving in the Royal Navy during World War II he also played football in Australia, New Zealand and Hong Kong. Russell’s benefit match was arranged for 16 April 1956. 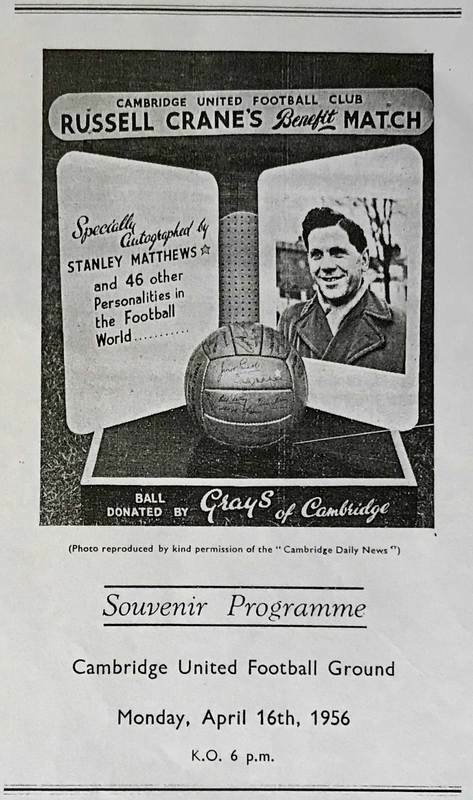 A draw prize was organised – a football autographed by Stanley Matthews and 46 other personalities in the football world. At the end of the match the ball was presented by the mayor of Cambridge (Alderman E T Halman) to the holder of the winning ticket. This was followed by a successful benefit dance held in the Guildhall. The stand depicted on the programme shown here was provided by Swainland & Son, signwriters. The football club in 1959 decided to start the development of the Habbin Stand. The site was cleared and the old dressing rooms dismantled. Teams of supporters, under the guidance of tradesmen, commenced the large task of digging the footings and cement-mixing, bricklaying etc. The fundraisers worked hard to provide cashflow. The architect of this development, who gave his services voluntarily, was R Jackson, a senior architect at South Cambs district council. In concluding my story, I would like to highlight the activities with United of my two sons, supporters since toddlers. Our eldest son Paul played in the youth team at the age of 16. Bill Leivers was then the club’s manager. At 18, when Ron Atkinson was manager, he was accepted into the reserve team. Paul had to decide whether he should become a professional or continue his career as an accountant. He chose the latter. Our youngest son Antony, a supporter all his life, exemplifies loyalty. Four friends including David Kurdyknowski, a car owner and fortunately a member of AA Relay, attempted the journey to Plymouth for an FA Cup game. Their car broke down 16 miles from Plymouth. The AA towed them to a garage and they continued their journey by hitch-hiking and buses, arriving at Plymouth for the kick-off. After the game they returned to the garage to learn that it could not effect repairs. They slept in the car and AA Relay conveyed the happy party back to Cambridge the following day. Antony's son Jake, not yet two years old, attended his first game at the United recently – 28 February 1992, when United beat Bristol Rovers 6-1. 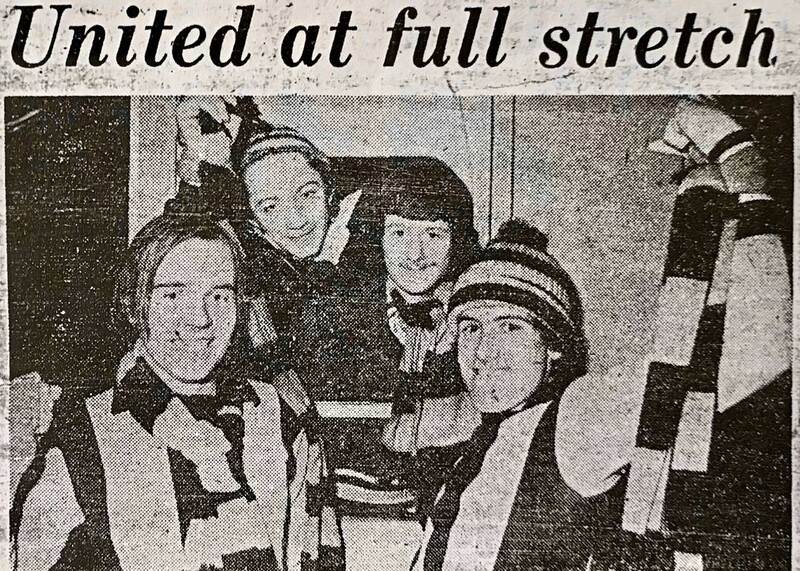 Therefore, over the past 45 years some four generations of the Crane/Neal families have been loyal supporters, and we all wish Cambridge United every success in their future endeavours. Supporters' exploits en route to Plymouth reported in the press. 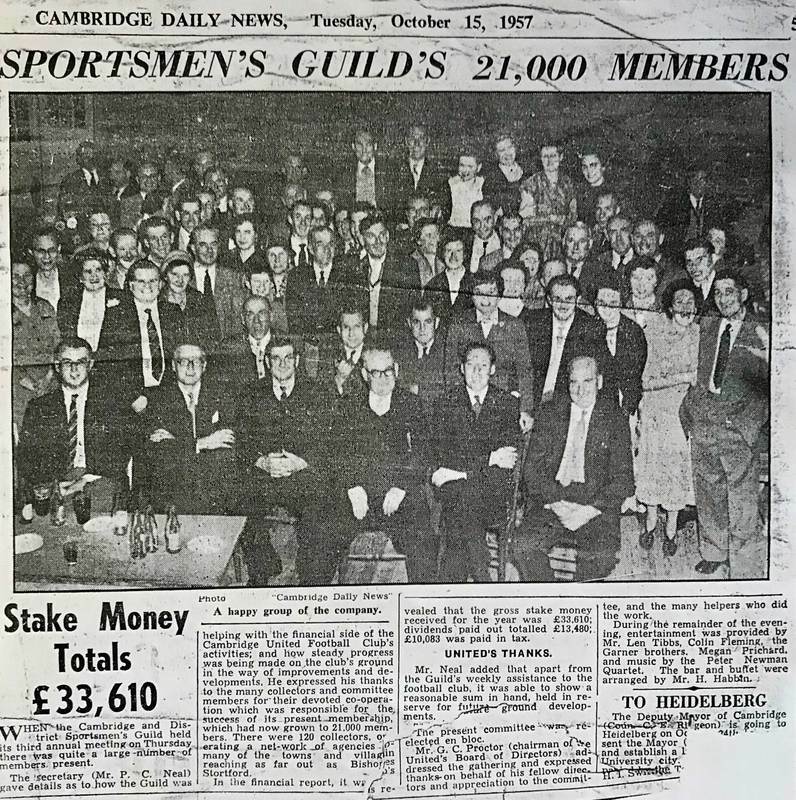 Success of the Cambridge & District Sportsmen's Guild, reported in the Cambridge Daily News of 15 October 1957. Programme for Russell Crane's benefit match, 16 April 1956.